Could Xbox Music challenge Spotify? Supposed new leaks from the latest Xbox 360 dashboard update beta and the Windows 8 music app have revealed potential pricing and cloud playlist details for Microsoft's Xbox Music service. Xbox Music was first announced at E3 in June, and rumors later that month claimed that the service would offer music streaming and downloads through the Xbox, Windows and Windows Phone, as well as cloud storage. There's been little word of it since, though, and Microsoft has remained mum on the details, as those are likely still getting ironed out. But now it seems as if Xbox Music could cost as much as $146 (UK£89, AU$141) for a year's subscription, if the leaked pricing info turns out to be accurate. Microsoft required Xbox 360 dashboard update beta users to legally promise not to reveal anything about the service to the media, but it appears someone didn't take that agreement seriously. 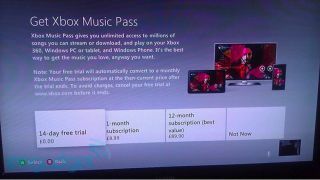 Images of the Xbox Music app on Xbox 360 were sent to Engadget, and they reveal that a year's subscription could cost $146 (UK£89,AU$141), while per-month subs looks to cost around $15 (UK£8.99, AU$14). Free 14-day trials will be offered as well. The words "Save as a Playlist" underneath an icon resembling a cloud suggest something about cloud playlists as well, a smart addition considering the Xbox Music service will span the Xbox 360, Windows PCs and tablets, and Windows Phone devices. Meanwhile, the Windows 8 Music app corroborates those rumored prices, which also happen to resemble the pricing structure for Microsoft's Zune music service. But will those be the only options? A user of the gaming forum NeoGAF spotted another tidbit that reveals that Xbox Music could also offer an ad-supported free option, as reported by Slashgear. This model would challenge Spotify for no-charge, ad-supported music-streaming dominance, and with so many Xbox 360s already plugged into living room speakers, Microsoft may be onto something here - if this rumor pans out, that is. Either way, Xbox Music is sure to aid in Microsoft's ongoing quest to dominate living rooms with every form of entertainment, possibly including original TV-style Xbox programming in addition to music, internet, streaming video, and more. Oh, and don't forget that the Xbox 360 still plays video games, as well. A Microsoft spokesperson declined to comment on the leak, simply remarking that Xbox Music will be Microsoft's "definitive music service" and promising to reveal more information as soon as it's available.